Can you believe it? It is Thanksgiving in less than two weeks! Easily one of my favorite holidays, Thanksgiving provides such a wonderful opportunity for friends and family to get together, talk, laugh, and eat way too much food. What more could you want? There are three “must-haves” on my Thanksgiving table each year (aside from the turkey, of course). These include stuffing, overnight mashed potatoes, and pumpkin pie. Undoubtedly, you have a similar list of “must-haves” for Thanksgiving as well, and that is what makes Thanksgiving dinner so special; everyone has a unique twist or special ingredient to make these classic recipes their own. I love that. 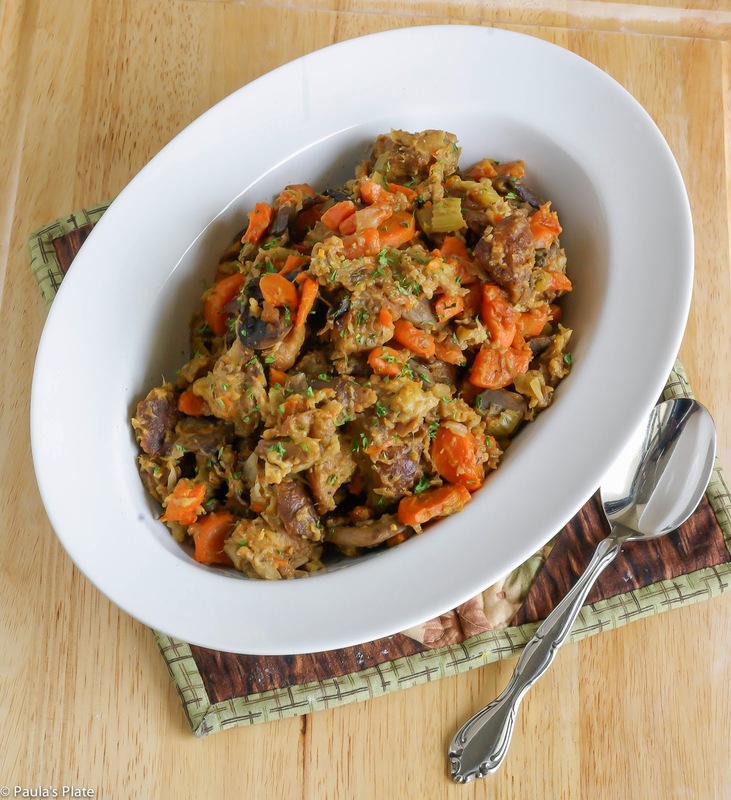 Today I want to share with you my all-time favorite stuffing recipe. It is flavorfully rich, perfectly moist, and best of all, doesn’t take up any valuable oven space! That’s right, this stuffing is prepared in the slow cooker. While many stuffing recipes include some sort of crumbled sausage, this recipe is meat-free (use vegetable stock instead of chicken stock if you want it completely vegetarian). If you are a die-hard sausage fan you can certainly add this ingredient, though the recipe doesn’t need it. With meaty mushrooms, fresh bread, and the wonderful flavors of sage, thyme, and marjoram, this recipe will satisfy any stuffing-lover at your Thanksgiving table. What are your “must-make” Thanksgiving menu items? Let me know below! Don’t have a slow cooker? Don’t worry! You may easily make this recipe in your oven as well. The directions follow below. Do you need meat in your stuffing recipe? Simply cook it up first in a hot skillet, remove from heat, and then incorporate with the cooked vegetables before combining in the slow cooker. The amount of stock used in the recipe will largely depend on the type of bread you use. I make my own bread cubes and toast them in the oven for about 20 minutes at 350 degrees or until dried and crunchy. This type of bread often requires less stock than the hard store bought bread cubes from the package. If you use the store-bought kind, you will have to use more stock. My most important advice is to add the broth slowly over the cooking process, incorporating only as much as needed. If it looks dry, you can always add more. If it gets too wet, simply remove the lid toward the end to let the juices evaporate a bit. This recipe makes 8 generous servings, if you need more, simply double it. The pictures show carrots because I had some to use up. If you want a traditional stuffing, leave them out. If you want an additional sweetness, add a cup or so of chopped carrots. 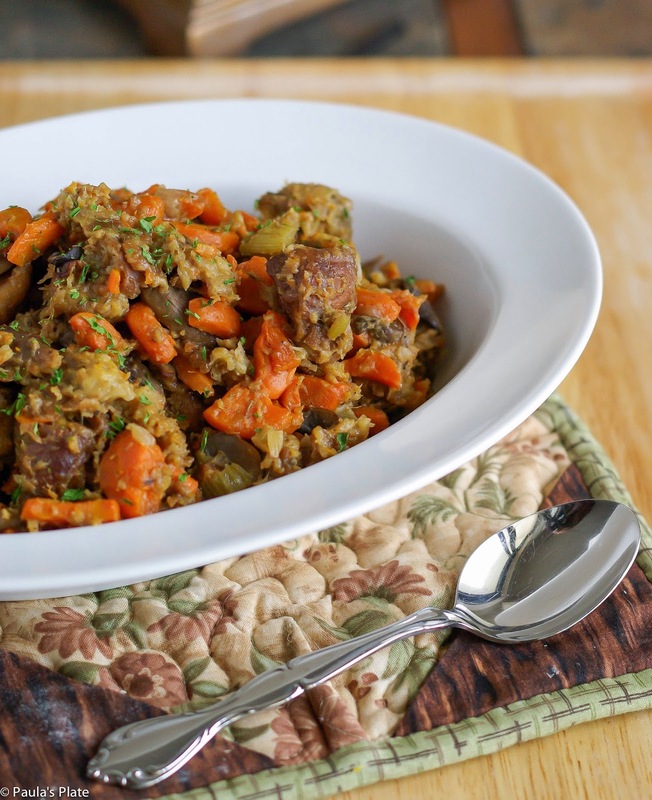 The BEST Thanksgiving Stuffing – Slow Cooker Style! 6 cups bread cubes (homemade or store bought) See notes above for amount of stock required with either option. Directions for homemade below. Melt butter in a skillet over medium heat. Add onion, celery, mushroom, apple, and parsley, stirring frequently until tender, about 8-10 minutes. Spoon cooked vegetables over bread cubes in a very large mixing bowl. Season with poultry seasoning, sage, thyme, marjoram, and salt and pepper. Pour in just enough broth to moisten, and mix in egg. Transfer mixture to slow cooker, and cover. Cook on High for 20 minutes, then reduce heat to Low, and cook for 4 to 8 hours. If your stuffing starts looking dry, incorporate a bit more stock. If it is too wet, simply remove the lid and let the liquid evaporate a bit. Heat oven to 350 degrees F. Spray 2-quart casserole with cooking spray; set aside. In 12-inch nonstick skillet, melt butter over medium heat. Add celery, onion, mushroom and apple; cook 6 to 8 minutes, stirring frequently, until tender. Stir in 1 cup broth, sage, salt, thyme and pepper; heat to boiling. Remove from heat. Stir in bread cubes until well mixed. Spoon mixture into casserole dish. If stuffing looks dry at this time, add in a bit more stock before transferring to casserole dish. Cover; bake 30 minutes. Uncover; bake 15 to 20 minutes longer or until hot and top is light golden brown. I really should make some just because. What exactly is poultry seasoning? Can I make my own?